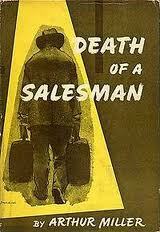 Death of a Salesman research papers can be Arthur Miller play analysis or a simple character study of Willy Loman. Research papers on Death of a Salesman look at the play from the aspect of the lost American dream. Since Paper Masters custom writes all its research, you can have your paper written on any theme or topic within Death of a Salesman. In Arthur Miller's Death of a Salesman, Willy Loman is the victim of false values - those found in the American Dream. The environment of his household, which evolves from his application of these values is obviously negatively influenced as are the personal lives of his sons and to perhaps a lesser degree, the life of his wife. Willy Loman himself does not go unscathed by the deception of false values, which is revealed in Death of a Salesman’s tragic end. Although not all of Loman’s family is effected in the same way or to the same degree, it becomes apparent that the false values that dictate Willy Loman’s occupation and view of the world will shape the development and ultimate destruction of the Loman family, at least in as far as Willy Loman is concerned. Similarly, while Willy Loman does nothing markedly destructive to society as a whole, his pursuit of the American dream under the auspices of successful and esteemed salesmanship has the potential to bring ruin on his family in Death of a Salesman. Willy Loman has contrived to live a life by what he believes are the dictates of society. Loman lives by what he believes will bring solidarity, prosperity and self-esteem to his family and, perhaps more importantly, to himself. Loman is misguided in his view of society and simple-minded in the solutions it offers. Unfortunately, his sons are disillusioned by his behavior and his wife becomes an advocate of his dependency on values that have no worth but what are ascribed to them by a discriminate and unfamiliar society. Paper Masters writes custom research papers on Death of a Salesman and can be Arthur Miller play analysis or a simple character study of Willy Loman.